It is most important to appreciate that all types of Marine Log , with the exception of the pulsed sonar Doppler Log, measure only the distance or speed through the water. In a current, tidal stream, or strong crosswind, this will not be the same as the actual distance or speed moved over the earth’s surface. 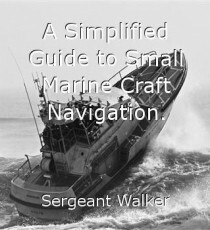 For example, if your craft is sailing at 5 knots against a tidal stream running at 2 knots, your log will indicate a speed of 5 knots for this is the speed at which your craft is moving through the water. However, this water is itself moving in the opposite direction at 2 knots, so you are only moving forward at a speed of 5 - 2 = 3 knots over the sea bed, over the ground, the Earth's surface. Similarly, if the tide turns so that you are now sailing with the tidal stream, your log will still indicate 5 knots, your-speed through the water, but in fact, you will be moving over the seabed at 5 + 2 = 7 knots. In Navigation, we call the distance or speed a vessel moves over the Earth's surface the distance made good or speed made good respectively. However, remember your log only registers the distance or speed your boat is travelling through the water. Later in this guide you will learn how to find the speed or distance your craft is making-good in a current or tidal stream. All of the different types of log have a common problem, in that of maintaining constant, unvarying contact with the surrounding water. Some have a lower susceptibility than others do but in general, a degree of integration is used to provide steady readings and give reasonably accurate results. Since aeration increases with Speed, the effect is for the log to read low at higher speeds. This is usually a fairly well defined constant for each particular craft and therefore can be allowed for in setting up. This requires many runs up and down a measure distance after installation at different speeds, making an initial compensating adjustment to the log at the boat's cruising speed, and producing a correction graph for other speeds. There are many measured distances around the coast and in estuaries and rivers. Their positions and course to steer between the markers are shown on navigational charts, with both ends of a measured distance are marked by beacons in transit. To cancel the effect of current or tidal stream, runs over the distance should be made as close to slack water as possible, and in opposite directions. Since a vessel should be going at a constant speed on a steady course before she approaches the run between the beacons, a sailing yacht should make the runs under her auxiliary motor power for log calibration purposes. The example that follows gives only two runs in opposite directions over a measured distance, but in practice, many runs will be required in order to achieve accurate results. Against the stream. Logged distance l.4 miles. Time taken, 10 minutes, 38 seconds. With the stream. Logged distance O.9 miles. Time taken, 7 minutes, 00 seconds. 1.4 + 0.9 miles – minute. Speed made good against the stream. Speed made good with the stream. True speed through the water. Thus, for every 7.89 miles recorded by the log the actual distance travelled through the water is 7.14 nautical miles. 7.89 x 100 = 9.52%. Which is too high. For hull fitting logs, calibration is in the norm affected by means of a simple calibration screw adjustment. Towed logs are rather more difficult to adjust but in general lengthening the log line tends to increase the log reading, shortening it to decrease the reading.